Editor-in-Chief Professor Dr. Peggy Blood, Savannah State University, USA. 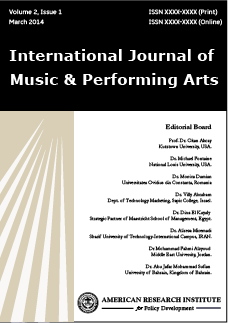 International Journal of Music and Performing Arts is a fully refereed international journal that provides clear, stimulating and readable accounts of contemporary research in music and performing arts worldwide, and a section containing extended book reviews which further current debates. The journal strives to strengthen connections between research and practice, so enhancing professional development and improving practice within the field of music education and performing arts. The range of subjects covers music teaching and learning in formal and informal contexts including classroom, individual, group and whole class instrumental and vocal teaching, music in higher education, international comparative music education, music in community settings, and teacher education. International Journal of Music and Performing Arts fosters conceptual and technical innovations in abstract, systematic musical thought and cultivates the historical study of musical concepts and compositional techniques. The journal publishes research with important and broad applications in the analysis of music and the history of music theory as well as theoretical or metatheoretical work that engages and stimulates ongoing discourse in the field. While remaining true to its original formalist outlook, the journal also addresses the influences of philosophy, mathematics, computer science, cognitive sciences, and anthropology on music theory and performing arts. Each paper published in International Journal of Music and Performing Arts is assigned a DOI®number, which appears beneath the author's affiliation in the published paper. Click HERE to know what is DOI (Digital Object Identifier)? Click HERE to retrieve Digital Object Identifiers (DOIs) for journal articles, books, and chapters. Dr. La Wanda J. Blakeney, Professor of Music, Louisiana State University in Shreveport, USA. Elizabeth Whittenburg Ozment, Ph.D., School of Liberal Arts, Georgia Gwinnett College, USA. Dr. Peggy Blood, Professor of Liberal Arts, Savannah State University, USA. Dr. Colomba K. Muriungi, Dept. of Arts and Humanities, Chuka University, Kenya. Dr Ese Odokuma, Dept. of Fine and Applied Arts, Delta state University, Nigeria.